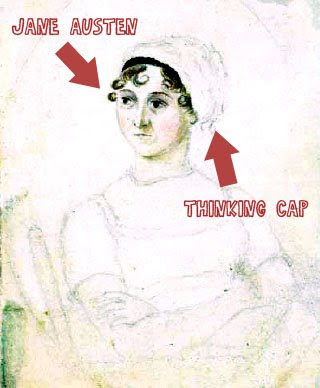 She had no way of knowing, of course, but Jane Austen created a brilliant means of exposing lazy American high school students who attempt to avoid reading Sense and Sensibility and instead watch the Ang Lee film adaptation. If a student ignorant of British spelling just watched the film and then attempted to write the paper based on what Emma Thompson and Kate Winslet did on their TV screen, this student could easily write a paper that refers to “Mr. Edward Ferris” instead of “Mr. Edward Ferrars.” After all, why would an American assume that this character’s name had an “R” in it? I know that a marginally intelligent student would doublecheck the spelling of the names on IMDb, but my theory more concerns the full-on idiots. Surely there’s been at least one kid in some English class somewhere who attempted to pass off their less-than-Cliffs Notes version of the book in a paper and got the name wrong, thus opening themselves up to ridicule and deserved punishment, right? I had a student write about Emma Bovary's "night in shiny armor" once. I don't even recall that in the Minnelli version. Sadly, they probably would still get a B at most schools. Things like this are the reasons I could never be a teacher. If I had a student do that, I'd give them a C to start with, because they obviously didn't read the book. Then, depending on the rest of the content, they're probably end up with an F. That way, it's a justifiable grade, and the student learns a lesson... at least if you're going to cheat, do it right. George: Such a scene would have made me enjoy that book more. M: Maybe so that no one else would pair up such things, but the posts share the fact that they're both based around names and confusion between two different cultures. Guy in the class above me wrote his final paper on how Elizabeth and Darcy are girls who are looking for rich husbands... "did not read book? no? FAIL"